I found a similar bottled dressing a few years ago, but it's not quite the same -- a little too chunky. 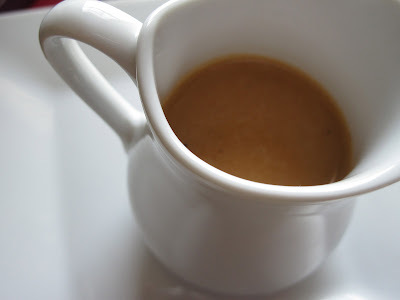 And I don't like being dependent on bottled dressing anyway, so I decided to explore making my own. Of course, there are quite a few recipes for "famous Japanese restaurant-style ginger salad dressing" (go ahead, Google it for yourself, I'll wait). The one I chose to use as a baseline for my adaptation had an ingredient list that seemed to correspond pretty closely to the bottled version (without the additives), plus it called for blending, which I figured would eliminate the chunkiness. Verdict (after a few tries)? A big hit! Just the right blend of sweet and tangy with no chunks. It is especially good on a simple spinach salad. And I'd be willing to bet it would make a great marinade for grilled chicken, too. Now I just need to find some good sushi to go with it. Combine all ingredients in a bowl. 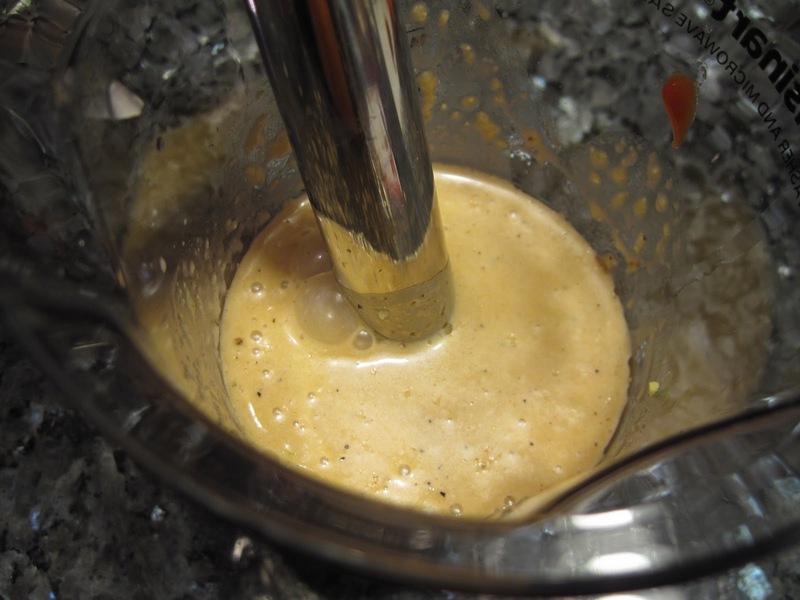 Using an immersion blender, blend until smooth. Fantastic- thank you so much! I miss great sushi too- there was plenty just near us in Sydney. Now that we're over in London, it's harder to find. I think this dressing is going to save me. Tori, I'm just jealous that you live in London -- my favorite city! If you try the dressing, please consider posting a comment on how it turned out for you or if you make any modifications. Thanks! I can't comment about the dressing, but the pictures are fantastic!! Oh, this looks super good. I love the dressing, but I almost always skip getting a salad at a sushi place because a.) iceberg and carrots = not a real salad and b.) HELLO MORE ROOM FOR SUSHI. This looks just like my recipe, except I sub miso for the tomato paste, and it turns out just as good (if not better) than any I've had in restaurants. I may try the tomato paste, since it's something I'm more likely to have on-hand at a given moment. Thanks! @Kristen: b) is a really, really good point! !